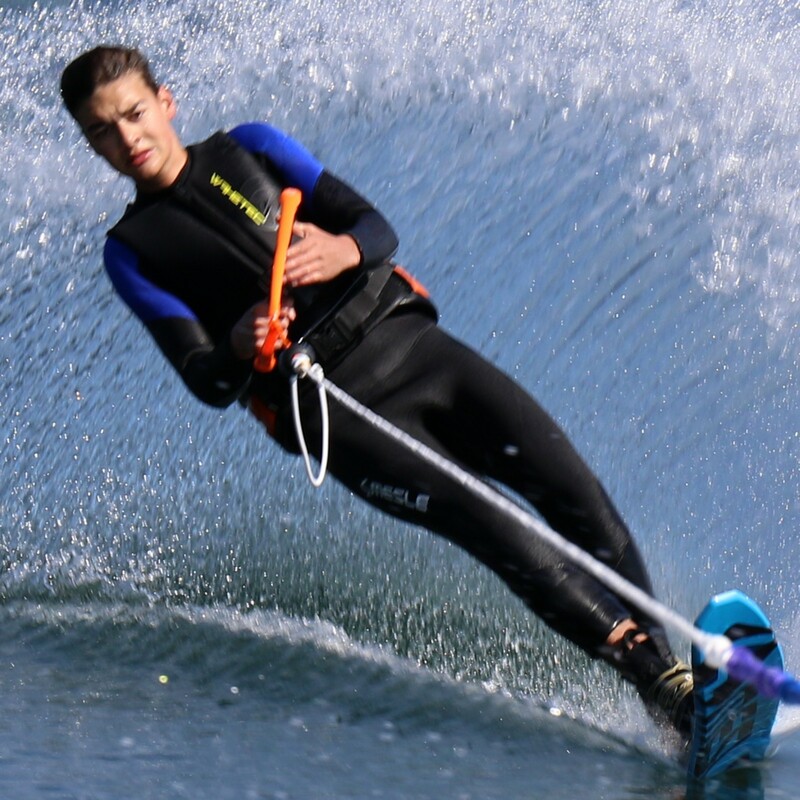 Durch das innovative Wake & Ski Trapez-System von Cape Reamol kann man sich mit weniger Kraftaufwand sicher übers Wasser ziehen lassen. Die Hantel wird über eine Umlenkrolle und einem Schnellauslösesystem mit einem Hüfttrapez verbunden. Durch die Umlenkung wirkt nach bewährtem Flaschenzugprinzip 50% weniger Zugkraft auf die Hantel. Darüber hinaus wird die Kraft gleichmäßig auf die Arme und das Zuggeschirr verteilt. Das entlastet die Arme und den Rücken und die Hälfte der gesamten Zugkraft wirkt tiefer und näher am Körperschwerpunkt. Das wiederum optimiert die Körperhaltung, verbesserte die Kontrolle und bringt mehr Sicherheit beim Fahren. Das System funktioniert nur mit dem speziell entwickelten automatischen Auslösemechanismus (Automatic Quick Release). Sobald Sie die Hantel loslassen trennt dieser die Verbindung zum Hüftgurt, indem das weiße Aktor-Kabel, welches während der Fahrt durchhängt, gestrafft wird. Der CR-Griffsystem bleibt mit dem Boot verbunden. Neben der besonders einfachen Bedienung ist im System als zusätzlicher Sicherheitsgarant eine Sollbruchstelle in Form eines speziellen Metallplätchens eingebaut. 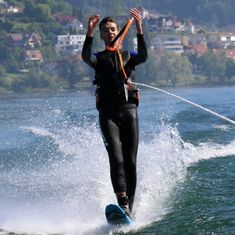 Das System ist ideal zum Wasserskifahren, Wakeboarden und viele andere Zugsportarten. Man braucht dabei nicht unbedingt ein starkes Motorboot, sondern kann das System auch an den Mast eines schnellen Segelboots einhängen. Diese neue Sportart nennt sich "Surf `n Sail", das heißt man kann an einem Segelboot surfen oder boarden. "What is new about this patented invention is the combination of a comfortable and highly loadable waist harness as well as an ingenious handle system. Both parts are connected with a tow system. The connection of the handle and the harness to the mainline is conducted over a pulley, using the well-tried principle of the pulley block. The resulting reduction of the physical effort needed on the handle by 50 %, relieves the arms and back considerably. Moreover, the pulley ensures an even distribution of the towing force on the handle and the harness, which works favourably on the whole body. Half of the entire towing force acts on the harness, which means it is in a much lower position on the body and therefore closer to the waterskier’s centre of gravity. This makes having good posture while skiing easier and the skier has better control. The system is only complete with the specially designed automatic release mechanism (automatic quick release). 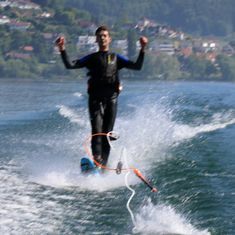 This immediately breaks the connection to the waist harness as soon as you let go of the handle and the actuator cord, which hangs slack during the ride, becomes tight. 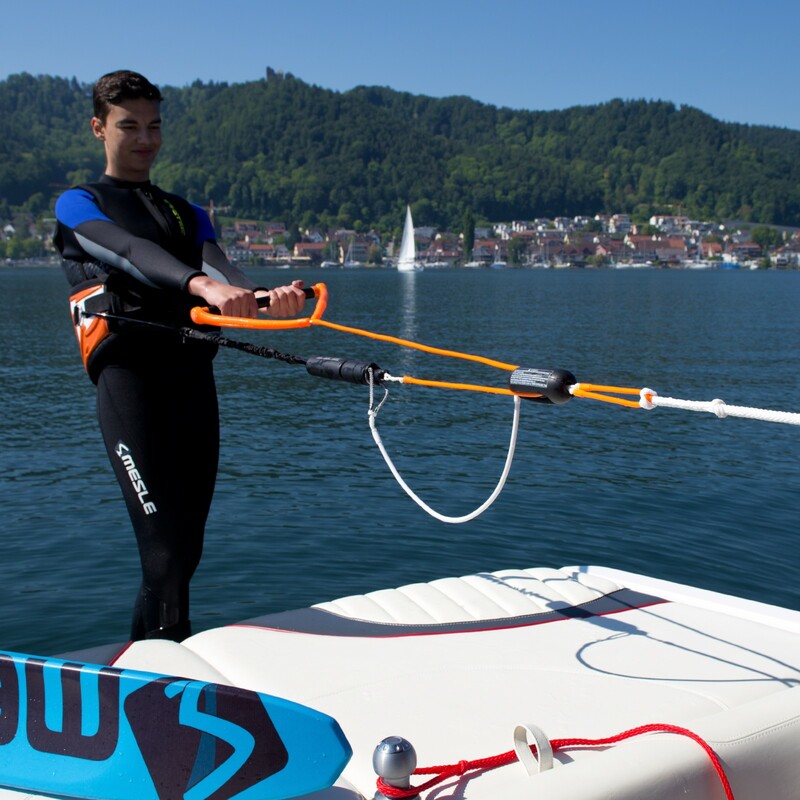 The CR handle system remains attached to the boat. Apart from the really simple operation the quick release contains an integrated weak link, which guarantees additional safety for the skier."